New Listing!Gracious 1 (or 2) bedroom apartment in lovely, intimate JER carpenter-designed building just off Fifth Avenue, across from the MET and Central Park.This apartment has a European flair with its prewar details throughout. WBF, elegant crown moldings, 10 ft high beamed ceilings, original solid herringbone floors, oversized windows, large square rooms with built in bookcases and cabinets. There is a pair of fluted columns at the entrance to the large sun flooded 17.1' by 29.1' south and west facing corner drawing room. One can look from here across Fifth Avenue to the Temple of Dendur. This elegant room and the formal dining room make it ideal for entertaining in style.The floorplan is flexible so bring your architect. (See suggested alternative floorplans attached for options).A.) 1 Br, 1 bath plus formal dining room with adjacent kitchen. OR,B.) 2 BR, 1 bath, with dining area at one end of huge LR., formal dining room becomes large bedroom. OR,C.) As it once was with a windowed kitchen in part of what is now the drawing room, plus a master bedroom with bath, as well as a formal dining room doubling for a guest room with second full bath en-suite.This boutique co-op is on a beautiful tree-lined street just off Fifth Avenue's Museum Mile where you will find the Met, Neue Galerie, Jewish Museum, Guggenheim Museum. Central Park is steps away and Madison Avenue fine shopping just around the corner. 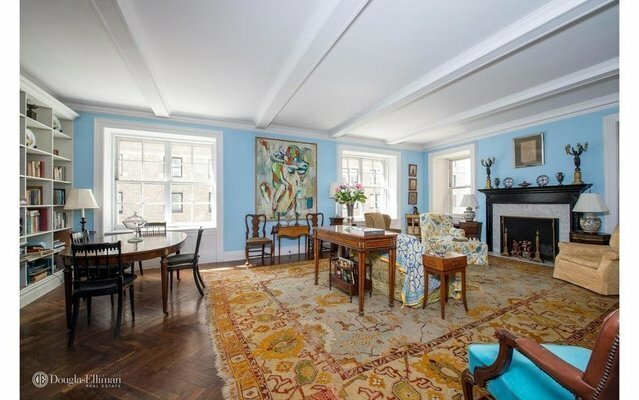 This is quintessential Upper East Side living. This well-run co-op has a live-in super, mail and packages are hand-delivered to your doorstep, laundry and storage are in the basement.